The doctoral dissertation The Don Quixote Complex and Investigations into Fictionality is based on the notion of mutable identity: The impulse that if I were another, the work I create would also be other. During my research I have experimented with conveying a fictional character as my colleague and introduced that we together have created the art productions that are part of this dissertation. This is to say that the point of departure has been to render a real character and that the idea of fiction as a potential is my basic supposition. The Don Quixote Complex and Investigations into Fictionality is an artistic and practice-led study, and during my research I have assumed writing, reading, and visual conception as my methods. In other words I have considered solutions that stem from an artistic practice and read with the intention of exploring plural identities. With the writing I navigate a meta-theoretical space and advance essays without claiming logical chronology, however I do claim writing as a performative practice. In the essay Andrea as Andrea in Andrea Meinin Bück the collaboration with a fictional character is recounted and the exhibition Lena Séraphin, Andrea Meinin The Don Quixote Complex is analyzed on the basis of embodied visual consideration. In The Wanderers I try out distancing while writing in third person, calling myself the essayist and letting her/him/it study subjectivity in relation to alter egos and doppelgangers. In Fiction as Threat and Possibility, Don Quixotes and Bovarysm I explore privileged narratives and literary works that reassess Miguel Cervantes’ character Don Quixote. The purpose is to contextualize the Don Quixote Complex, to transform a literary figuration to a spatial rendition and show how fiction can have cognitive capacity. The Don Quixote Complex and Investigations into Fictionality strives to show the imaginary as a knowledgeable environment and affirm multiplying claims on identity. 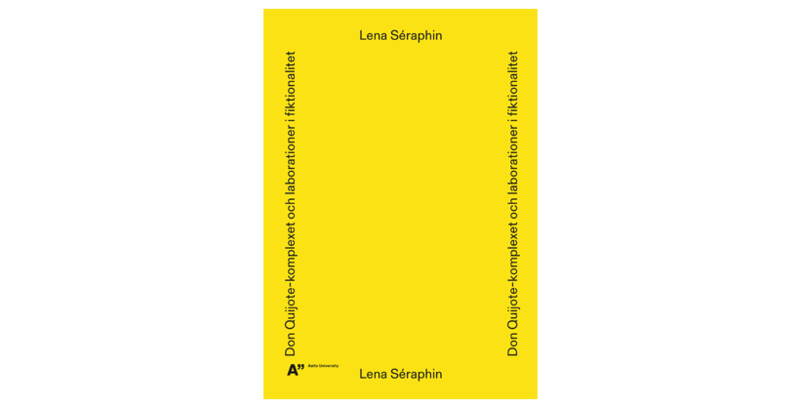 Lena Séraphin defends her doctoral thesis The Don Quixote Complex and Investigations into Fictionality on Friday 24 March 2017 at 12, Sampo Hall, Aalto University School of Arts, Design and Architecture, Hämeentie 135 C, Helsinki. The dissertation is titled The Don Quixote Complex and Investigations into Fictionality. How can a photograph of a nazi march-past in Hanko, on the 2nd of June 1943, be shown without elevating and reproducing absolute power? The idea of fiction as a potential is the basic assumption in this practice-led study, and the point of departure has been to render a real character. During research Lena Séraphin has experimented with conveying a fictional character as her colleague and with how they together can generate art productions that are part of this dissertation. Séraphin observes an other conception which is synchronized with the appearance of the character Andrea Meinin Bück – the more the character became actual the more Lena Séraphin became fictitious in the artwork Lena Séraphin, Andrea Meinin Bück & The Don Quixote Complex. Séraphin explores subjectivity in relation to the experience of polarization looking at a photograph of the march-past engendered. She investigates duplication/partition in literary, neurocognitive and theoretical understandings of alter egos and Doppelgängers, and shows how analysis and reflection embraces identification with the research problematics. This dissertation strives to show the imaginary as a knowledge creating environment and to affirm multiplying claims on identity. Meinin Bück and Séraphin have experimented by displaying photographs from military archives within an artistic statement and the installation Lena Séraphin, Andrea Meinin Bück & The Don Quixote Complex. Séraphin discusses this spatial and narrative work, which is the research outcome, and suggests reaiming as a method to make archival images topical in a personal sphere and to open up sealed notions. The attached photograph SA-kuva 128819 can be freely published provided with the source information Finnish Defence Forces. Caption: Vapaaehtoispataljoonan ohimarssi (”March Past of Volunteer Battalion”). Photographed by military official Esko Suomela in Hanko 2/6/1943. Lena Séraphin is a visual artist. She has graduated from Goldsmiths’ College (University of London) in 1997 and from Taideteollinen korkeakoulu in 1998.